A pop-up replica of two Shakespearean theatres with room for almost 1,000 spectators could be built in York's historic centre. The idea is based on similar pop-up theatres in New Zealand and Australia. Councillors are recommended to approve plans for the Elizabethan-style threatre when they meet on Thursday. The plans by Lunchbox Theatrical Productions would see them produce Richard III, Macbeth, Romeo and Juliet and A Midsummer Night's Dream over the course of ten weeks during 2018. The report to the council's executive said "this major cultural attraction will benefit residents and visitors alike" and contribute £7m to York's economy. Officers said the theatre would be Europe's first full-scale working replica of a traditional Shakespearean theatre. 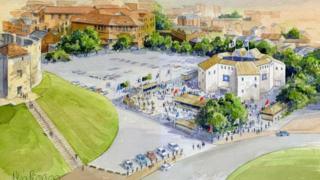 It will be modelled on a combination of the Rose and Globe theatres, built in London in 1587 and 1599 respectively. Councillor Nigel Ayre, executive member for culture, leisure and tourism, said: "I think it is an absolutely enormous benefit to the the city. "It is something that Europe has not seen before, something that has been hugely popular in South Australia and New Zealand." The report says the plan would require 135 of the 313 car park's spaces and the company would pay the council £197,308 to cover the loss of revenue. It would use the site from 21 May to 23 September 2018, with the theatre running from 18 June to 2 September. It hopes to attract 100,000 people, including up to 20,000 students. What can you learn from Shakespeare’s heroines? Video Why is Shakespeare so important?